THE MANY IMPORTANT FACTS YOU SHOULD KNOW! Get our FREE white paper and definitive guide to Kauai Beach Wedding Locations. Tell us more about your desired wedding so we can send you the best information about these wedding venues. Please complete the form below and receive your information immediately. Date and Start time are important for us to give you the best suggestions back. See some of our locations below this form. 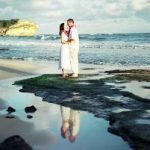 Our most popular beach for weddings and vow renewals on Kauai. 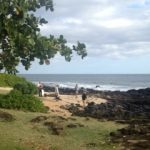 Located on the South shore in the Poipu Koloa area, just below the Grand Hyatt resort.Great weather and scenic beauty make it #1! A popular option is a sunset ceremony and dinner reservations at “Tidepools”, the Hyatt’s open air on their water feature restaurant. 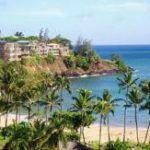 Located on the Eastern shore of Kauai near the airport town of Lihue and close to Kapaa. 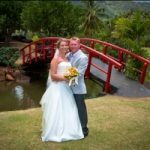 Lydgate is usually very private and its proximity to the Islands most popular luau, Smiths Tropical Gardens & Luau make it a perfect ceremony spot prior to attending the luau which is a popular reception option. Located on the North shore of Kauai is Anini beach. Many different beaches exist along the long beach front road. Choose your special spot on this beach to maximize privacy. This location was popularized in the movie “South Pacific” and is in a more remote area of the Island. Just up the road the road actually ends and one can go no further. That spot is another venue option and is called Ke’e beach. This location is on the South shore in Koloa. Located on the Eastern shore and just below the Marriott resort. Convient walking access from the large boat harbor, Nawiliwili makes Kalapaki a popular option for those taking the around the Hawaiian Islands cruise No sunsets here so it is best for sunrise, morning and afternoon ceremonies. 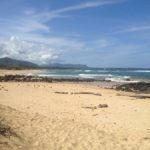 Our most popular beach location on the North shore of Kauai.The 2 main areas we use are by the pier and the other is called “Pine Trees” noted for those trees that come right up to the beach. Sunset weddings are popular on this busy beach after the beachgoers depart for the day. Great spot for those staying in Princeville. 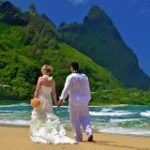 One heck of a beautiful spot Tunnels beach is a popular North shore of Kauai wedding and vow renewal option. Just be aware that the Northern shore experiences more rain than in the South. This location is near the airport town of Lihue and close to Kapaa on the Eastern shore. Absolutely gorgeous and often very private. Two great option here! Beautiful tropical gardens with small lake and many great photo sites. Or take a short boat ride up the Wailua River to the famed “Fern Grotto”. Private! Views! Small Cost! 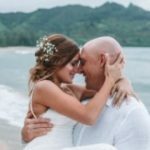 On Kauai’s South shore is this New Wedding Venue. The “Waimea Cottages” are an excellent spot on the South shore that provide accommodation options, private wedding site and receptions too! The quintessential “Hawaii” church on the South shore in the town of Koloa is the “Old Koloa Church” This is our most popular minister, Harold Kilborns church.